Valencia CF president publicly stated today that goalkeeper Vicente Guaita will stay in Valencia CF and that FC Barcelona can forget about him. 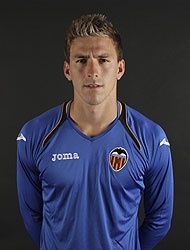 Manuel Llorente as some of you may now has been under pressure to have more Spanish players in the squad, especially Valencianistas and so expect Diego Alves to leave, rather than Guaita. Now they may both stay, but that is very unlikely and both of them are likely to not be satisfied with that kind of decision as none of them really has a firm grim on the starting place and one week playing and then not playing doesn't give any of the goalkeepers momentum and to keep their form. So now we know that Vicente Guaita is going to stay for many more years as Llorente said and expect Diego Alves to be sold, but even more than that expect several new Spanish reinforcements to come in the summer.